‘Azzun ‘Atma is a village enclosed between the settlements Oranit, Elkana and Sha’arei Tikva and the separation wall. The village is surrounded by a fence, traffic to and from it requires going through two checkpoints. For any practical purposes, it has become a prison compound. Any communication between the villagers and the external world requires the permission of soldiers and through checkpoints (pictured: the checkpoint on the western end of the village). Ten families that were left on the other side of the separation wall have to go through the checkpoint on their way to the village grocery store. They are restricted with a ration of goods they can buy (see here), for fear that they will use them for trade in Israel proper, west of the Green Line. No terrorist actions ever came out of this village. And all this is only in order to leave those three settlements on the western side of the wall. More on a ‘Azzun ‘Atma: Imprisoned Tomatoes (April 2009); “We’re Jailed Here, Do Something. You Must” (May 2009). The pedestrian waiting point is empty. For six months now there hasn’t been a requirement for the tasrikh, the permit for vehicular passage through the checkpoint. Obtaining the tasrikh was complicated and expensive. Many residents of the West Bank took a cab up to the checkpoint, crossed it through the pedestrian post, and then took another cab afterwards. 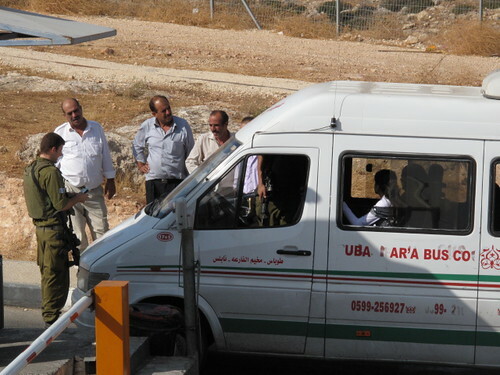 Many would cram into one taxi to save on the costs of travel (1 shekel from Nablus to the checkpoint, another shekel from the checkpoint to the nearby villages: Huwwara, Bita, Burin, Udala). It is a welcomed change. There is no need to switch taxis, and it is much easier to wait will sitting inside a car. The encounter with the soldier is also less intimidating from within a car. The downside is that not only is there no need for a tasrikh for vehicular passage, pedestrian passage is not allowed. The pedestrian checkpoint is closed, unmanned. Those who arrive there by foot, are sent back. The most natural means of transportation for people, their pair of legs, has been deprived from West Bank Palestinians. While the checkpoint is much easier to cope with now, it also presents a severe withdrawal of human rights and and freedom of movement. The photos are of the pedestrian checkpoint at Huwwara, today. Top: A closed gate at the exit from the pedestrian checkpoint. Bottom: The checkpoint from aside. The concrete structure served as a solitary confinement cell. Irtah (Ephraim terminal), south of Tulkarm, Thursday, December 24th, 2009, 4:45 pm. The upper photos show the carousels at the entrance to the terminal, the bottom photo shows the “midway” carousels, between one part of the terminal to the next. See also previous posts on Irtah, in the early morning hour; in the late afternoon. Last Friday (December 4, 2009) an Israeli police force blocked a group of peace activists in the Shuhada street in Hebron (Palestinians are not allowed to drive in Shuada Street although they are its residents). The policemen claimed to have a signed order by an Army general, declaring the area to be a Closed Military Zone. Despite our demand, we did not see the order. Therefore, I was unable to publish a post on Hebron as I was hoping to. 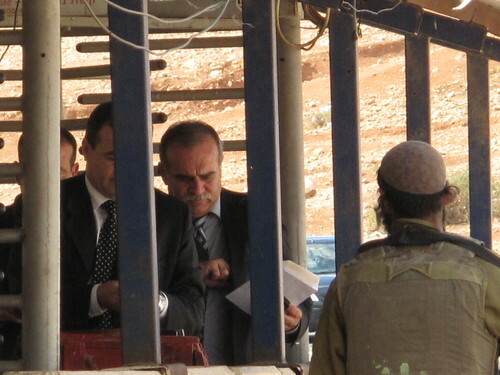 I will be in Hebron this week, too, so I hope I will be allowed to enter the Closed Zone. Beginning next week, the blog will return to its normal activity. The efforts to restrict peace activists from the arenas of occupation is recently increasing. Of course, it is always done under the auspices of the exhausted arguments of security (the disruption of the delicate balance, interference with the work of military forces, and of course “it’s too dangerous for you, we are protecting you”). The intention is clear: to cease documentation. To stifle rumors. At times, this is even made explicit. In many years to come, children will ask questions, parents and grandparents will apologize. They will try to explain that at the time it seemed reasonable, that they only wanted to have a good story to tell around the bonfire, and above all – that rumors were stifled. Above: a rumor that has not yet been stifled. Qalandiya checkpoint, Ramadan, September 2008. Click here for a Hebrew version of the post. A siege (Keter or Matzor in Hebrew) is the surrounding of an area and the full or partial prevention of access into or out of it. Nablus, for example, the whole city, the refugee camp and the 15 villages around it, all in all 20 thousand residents, is under such a siege for more than seven years. 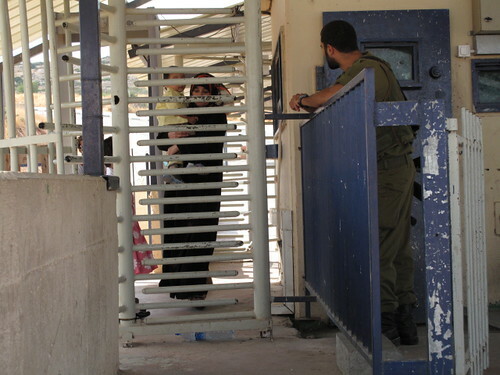 Entry and exit are possible only through one of the three checkpoints surrounding it (Huwwara, Dir Sharaf and Beit-Furik), and only after examination at the entrance and mainly at the exit from it. Other access ways to and from the city have been blocked by concrete blocks, fences, dirt mounds, and iron arms. During a curfew (‘otzer in Hebrew) leaving one’s house is prohibited. There is a further prohibition on financial activity. A prolonged curfew is collective punishment, and is against international law. During a closure (Seger in Hebrew), all entry permits to Israel are cancelled. Permits that were issued to residents of the West Bank for the sake of work and medical care. In 2000, during the Al-Aqsa riots, the whole territories were put under a complete closure. A general closure is when entry is allowed with a permit, usually in the form of a magnetic card. In fact, the West Bank is under this closure since the first Gulf War of 1991. Eventually, and under severe restrictions, Israel began allowing entry for medical and financial purposes. However, following acts of violence, or during Jewish holidays a complete closure is imposed on the West Bank and all permits are cancelled. The Hebrew calendar marks a new year this Friday night. As Israelis wish each other hopeful prayers for the new year, I wish for change this year. 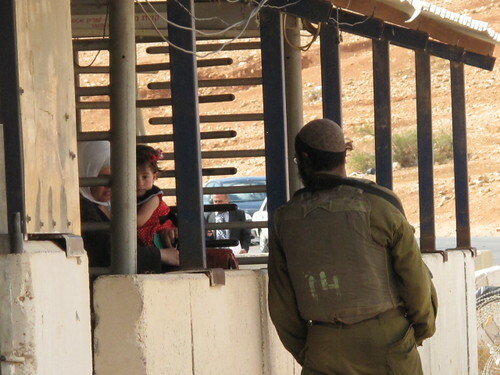 In the picture – a father and his son waiting, Beit Lehem CP; September 4, 2009. Freedom of movement, freedom of worship, the freedom to control one’s own time, to be able to assess how long it will take to get back home. 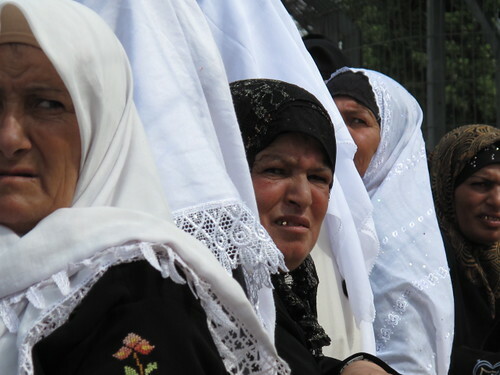 Pictured: Palestinians waiting, Friday, September 4th, 2009, at the Bethlehem checkpoint. The Bethlehem checkpoint had this Friday some 12,000 people pass through on their way to the prayers on the second Friday of Ramadan, at Al-Aqsa. Passage was allowed only for women above 50 and men above 45. Children under 15. Before the Bethlehem checkpoint, three more temporary checkpoints were added, especially for Ramadan. 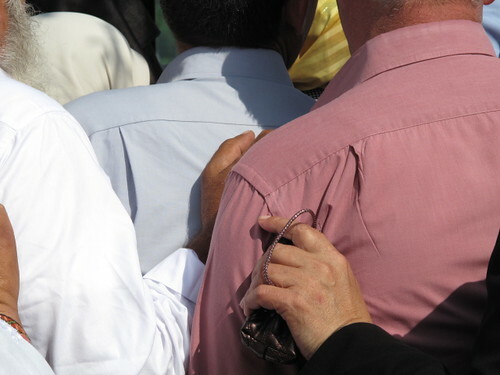 Four checkpoints, while fasting, dressed in Sunday Clothes, about two hours wait. See also last week’s post on the first Friday of Ramadan, at Qalandiya.